Stowmarket Catholic church sits at the other end of the main street of this busy market town to its Anglican counterpart. Before the Reformation, Catholic priests ministered to the faithful at two churches, St Mary and St Peter, either side of a central churchyard. St Mary has now gone, and the other church bears a dual dedication to both saints. It also, enjoys, of course, the stewardship of the Church of England, since the Reformation swept the Catholic church from the English parishes in the 16th century. Stowmarket is an industrial town, and in the 19th century its atmosphere was strongly protestant. All over England, the Oxford Movement was slowly, but relentlessly, beginning to return some aspects of Catholic doctrine and practice back into the established church. However, this cut little ice with the Rector of St Peter and St Mary, the strongly evangelical George Staunton Barrow. In the 1870s, Stowmarket was renowned in Suffolk for its resistance to 'papist' ideas, so one can well imagine the feelings of the Reverend Barrow when his sister, Adelaide Clutterbuck, who had recently been received into the Catholic church, moved to the town with her husband. Mrs Clutterbuck was a magnificent woman, stepping straight out of the pages of a Trollope novel, and bringing a Trollopian story with her. At this time, the Catholics of Stowmarket were few and far between, and had to make the 15 mile journey to either Bury or Ipswich for Mass, or for their children to attend Catholic school. Throughout the long penal years, the Faith had been maintained in this area by priests, many of them Jesuits, kept hidden at several country houses, including Haughley Park and Wetherden Hall. These brave men lived uncertain lives, always at the risk of a grisly public death if they were caught. And several of them were. By the Reverend Barrow's day, practice of the Catholic faith had been legal for 80 years, and Catholics had had the right of free assembly for 40 years. But there was still an enormous amount of anti-Catholic prejudice, based on the former laws, sustained by the preaching of the likes of the Reverend Barrow, and exacerbated, it must be said, by the regular reception into the Church of people like Adelaide Clutterbuck, on the heels of Newman and Manning, who crossed the Tiber in the mid-century. 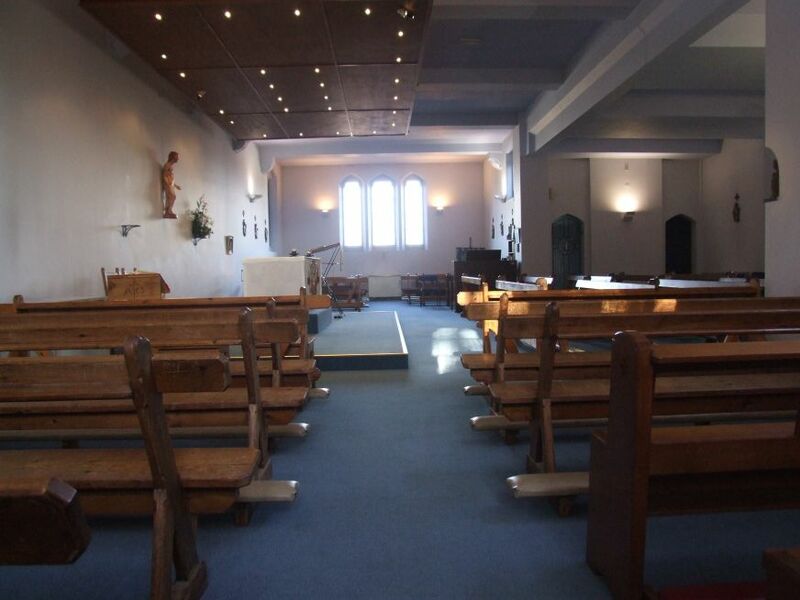 It was not long before Adelaide Clutterbuck began to organise the Catholics of Stowmarket. 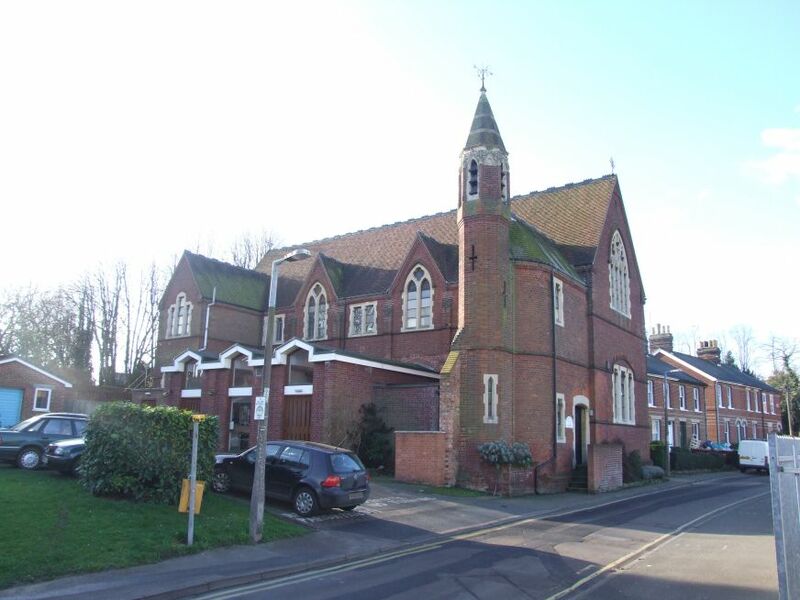 She arranged for Father Arthur Wallace, parish priest of St Mary, Ipswich, to come out to Stowmarket on the train once a week, to celebrate Mass at the chapel in her house, The Beeches, Violet Hill. As interest grew, she purchased land in Milton Road, with the help of the Duke of Norfolk. The new Catholic church at Kirtling, near Newmarket, had been built to replace a corrugated iron hut, and this hut was brought to Stowmarket by train, and erected on the land. A small school was built beside it, and quickly attracted upwards of 60 or 70 pupils. Adelaide Clutterbuck's masterstroke, however, was to convince the Bishop of Northampton, in whose Diocese Stowmarket came, to appoint a permanent priest to serve a new parish centred on the church. Father Francis Warmoll arrived in Stowmarket in 1879. Like Mrs Clutterbuck, he was a former Anglican, the son of the Vicar of St Margaret, Sotterley. With his brother, he had been received into the Catholic church along with hundreds of others in the 1860s, part of a haemorrhaging that coincided with a renewed resistance to Oxford Movement teaching in some Anglican parishes. His brother had also become a Catholic priest. Young and enthusiastic, he would prove to be the catalyst that Stowmarket needed. Within a few months, he had negotiated with an order of Ursuline sisters to move their community to the town. By devious negotiation, he bought up half a dozen ajoining plots of land off of Strickland Road. One of the vendors realised who he was, and immediately raised the price from £30 to £300, which had to be accepted. The Suffolk Free Press, when rumours of the purchase reached its staunchly impartial ears, reacted: "Stowmarket has long been deemed the shining light of Evangelical truth in central Suffolk, but it is now becoming notorious for the activity with which Roman Catholic propaganda is being pushed within its midst. Prudent men will not be misled by glowing descriptions of increasing numbers until they have made themselves acquainted with the social and religious conditions under which a comparitively new agent came into work, and have analysed the modes by which the new agent effects its purpose." The plans were ambitious. The site was roughly square. Along one side, a convent and school hall would be built. At right angles to it, and abutting Strickland Road, another building would house the convent chapel and infant school. 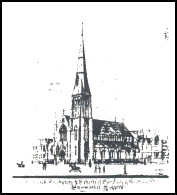 On the space inside this L-shape, a magnificent church was planned, with a tall, slender spire, in the Early English style. The architect was A.E. Purdie. It would be the biggest Catholic church in Suffolk, as big as the huge church of Our Lady and the English Martyrs in Cambridge, forty miles away. 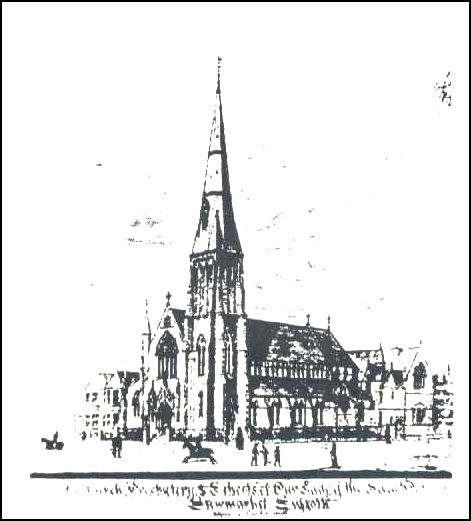 Before it could be built, the convent chapel was used as a temporary parish church. This was opened in 1884, and dedicated to Our Lady of the Seven Dolours. It was on the first floor of the building, with the infant school below. It was a bit inconvenient for a parish church, but was tolerable as a temporary measure. Despite the hints in the Suffolk Free Press that some outside agency was funding the work, it seems to have been almost entirely founded on the personal wealth of Father Warmoll, inherited from his family. Almost every penny went into building the convent chapel and infant school, and the large hall built as a high school. But Father Warmoll had overstretched himself. The project began to founder at this point. Stowmarket was a poor town, and the school could not attract enough paying customers. Father Warmoll, with his hectic parish schedule and failing health, could not guarantee the sisters a daily Mass. Within four years, they had left. Father Warmoll appealled in the Catholic press for another order to come and take over, but this did not happen, and the Warmoll fortunes had been exhausted. In the end, and reluctantly, the hall was sold, along with the land designated for the great church. It would never be built. The convent chapel of Our Lady of the Seven Dolours became the parish church, a role it would fulfill until 1970. In 1899, Father Warmoll died, at the age of just 49. In 1884, he had written an open letter to the Suffolk Free Press to protest about its anti-Catholic bias. "Allow me with all sincerity to say that you know nothing at all about the Catholic faith. You have heard things and read from your very childhood... but all this is from the enemies of the Catholic faith. You have never heard the other side. The Catholic Church is not a thing to be despised. It is something that has withstood the test of ages. Even look at our old church in the Market Place. Think of its history, and see how they have tried to efface Catholicity from its very stonework, and in doing so have struck out the name of Jesus." One assumes that this did little to endear him to the likes of Reverend Barrow and his friends. It is a sign, then, of the respect he built up over the following 15 years that, on the day of his funeral, the shops of Stowmarket closed, and he was accompanied to his grave by civic dignitaries. In 1970, in deference to the changing needs of the liturgy in the light of Vatican II, and, perhaps, an increasing awareness of the unsuitability of an upstairs church for less mobile people, a radical change was made. The south wall of the ground floor was removed, and an extension added towards the presbytery. 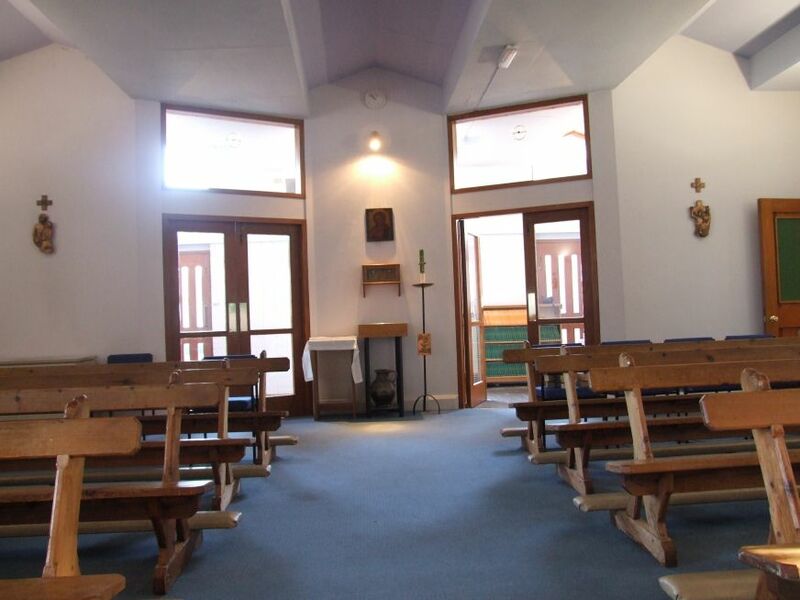 Here, on the ground floor, one of Suffolk's first post-Vatican II reorderings took place, with the seats facing south in a semi-circle about the altar. 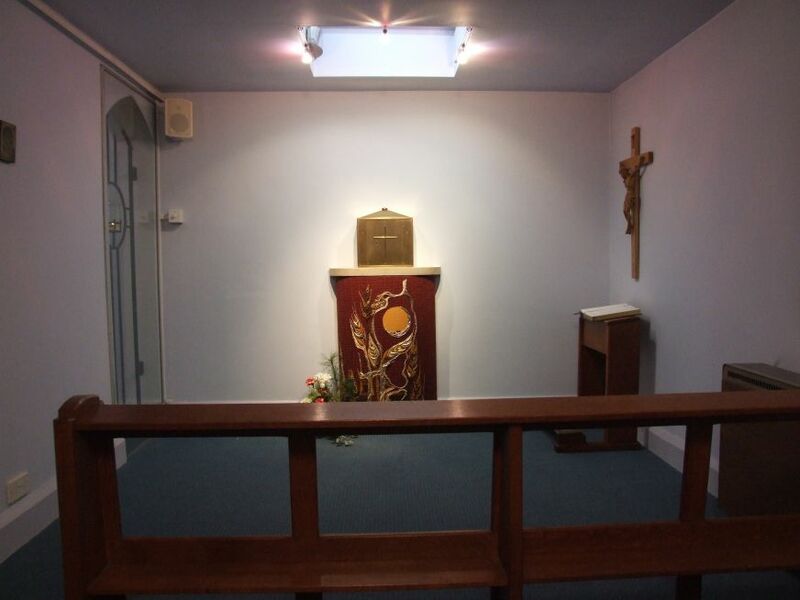 A chapel to the Blessed Sacrament was added, and the whole thing is simple and beautiful, and fitting for the needs of this massive parish. The upstairs room is now the parish hall. The outside of the building is in rather stark contrast to the modernist interior. At the same time, the dedication of the church seems to have been simplified to Our Lady, which seems rather a pity. I said that this was a massive parish, and it is. It stretches nearly twenty miles across, from Rattlesden in the west to Debenham in the east, from Westhorpe in the north to Hemingstone and Otley in the south. It contains within its borders no less than 83 pre-Reformation Catholic parishes, a sign of how the ecclesiastical landscape has changes. 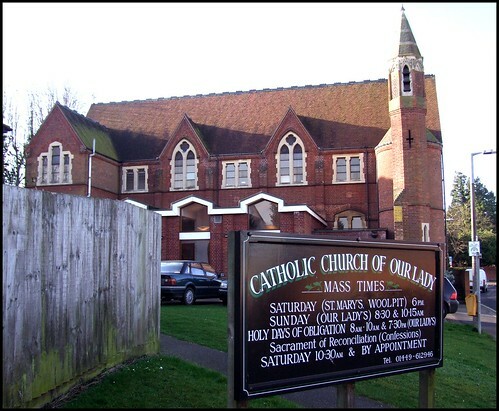 It is not only the largest parish in Suffolk, Catholic or Anglican, but the largest in East Anglia. 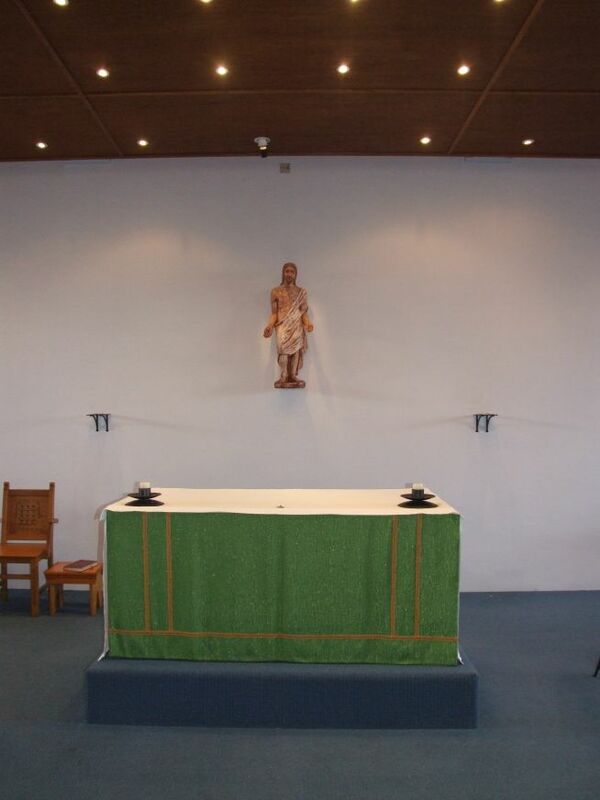 There are Mass centres in several places, and the Anglican parish churches at Woolpit and Needham Market are also used for Masses. It is a huge undertaking, and much parish work is devolved to lay teams working in different parts of the area.Where once 83 Catholic priests ministered, now there is just one, the remarkably energetic Father Denis Lloyd, who, like Adelaide Clutterbuck and Francis Warmoll before him, is a former Anglican. 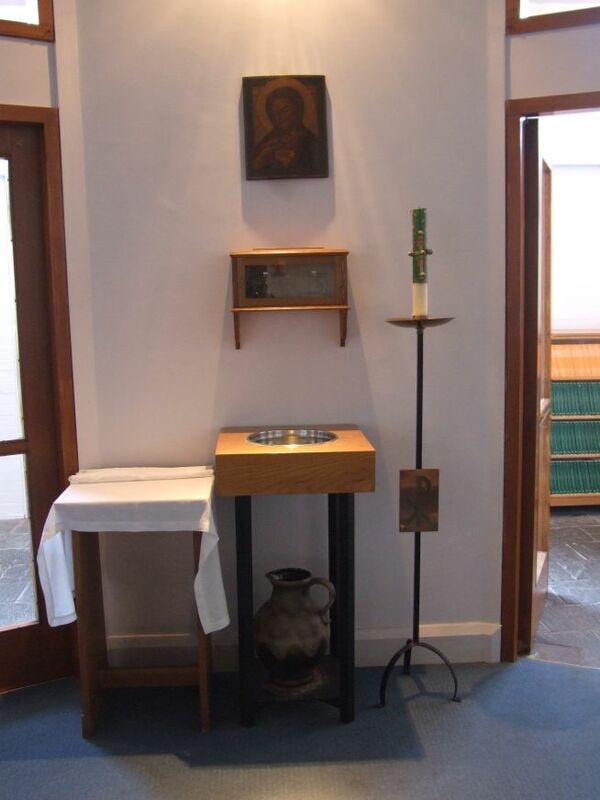 Father Denis has worked hard to further beautify this very devotional interior. There are icons, candles, terracotta statues, and the beautiful, intricate needlework of Isobel Clover. The church is a little jewel, and a delight to visit. This entry would have been impossible without reference to the excellent book The First Hundred Years by P.D. Patey, which is available from the church.